Google recently unveiled its latest search offering, Google Patent Search. The service will enable users to search 7 million patents by criteria including patent number, inventor, and filing date. Images of original patents can also be viewed online. Search results don't include any related text ads at launch, and Google said there are no plans for ads at this time. You discover a bug you've never seen before. What is it?, you wonder. Wonder no more. 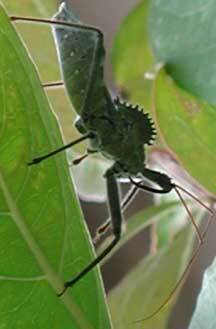 Scroll through www.whatsthatbug.com and see if it has already been identified. The site is run by two photographers who consult regularly with entomologists. If you don't see your bug online, e-mail the photo and they might be able to tell you what it is. Webaroo has produced a squeezed-down version of the Web - they throw away everything they don't think is necessary for a Web search. And they are selling it to makers of laptops. They offer "Web packs" themed for cities, sports, history and other topics. And it's small enough to fit on your cell phone or PDA - so search can now be unplugged. (It only runs on phones with Microsoft's mobile operating system for now.) Best of all, it's free! Web pages change frequently; some disappear entirely. The Wayback Machine offers an option for viewing selected web pages dating back to 1996. Currently, some 55 billion web pages are archived on the site. Unfortunately, some web sites block inclusion on the Internet Archive. You search the Wayback Machine by typing in a web address. You'll then get a list of dates the Web site was archived, and can select from any of the dates listed. It can take 6-12 months for a web page to show up in the Internet Archive. The search engines Gigablast and Yahoo both offer search results with links to Wayback Machine options. When searching Gigablast, the search results display links to a recently cached copy as well as to "older copies"; the older copies are from the Internet Archive. When using Yahoo, you'll be offered a link to the Wayback Machine archive after opening the cached copy of a web page. A new Web site, Healthline.com, works as a medical search engine by allowing users to look for articles from about 66,000 Web sites with medical content, the New York Timesreports. The Web site, which is owned by Healthline Networks, is a "resurrection" of YourDoctor.com, a company created in 1999 to develop a searchable, user-friendly database of original medical content and information published by others, according to West Shell III, Healthline's chair and CEO. YourDoctor.com closed in 2001. Its original investors, however, began to see new interest in Internet advertisers and hired Shell to revive the idea under the Healthline brand, the Times reports. Healthline says its site offers a broader choice of information thanWebMD - the most popular online medical resource - and a more refined choice than general search engines such as Google. Shell said WebMD and other online publishers offer content that is "high-quality [and] trusted" but "limited in lots of different ways." Shell predicted that Healthline would succeed because Internet users often want multiple sources of information. "One answer doesn't make you informed," he said. Can You Ask Me Now? AskMeNow, a new cell phone service, can answer any query in minutes with a text message. Easy questions are free; hard ones cost 49 cents. After you become a registered user, call questions in to 1-888-EZ-ASKME (392-7563). Once you're registered, you can also choose from their FREE automated menu to get sports scores, stock quotes, driving directions, 411 info and much more within just seconds! Use I4U (Promotional Code) at sign-up - then you can ask AskMeNow anything as many times as you'd like for 30 days entirely for free, courtesy of i4u.com. After the 30 days there's no credit card, no minimums, no monthly fee, all AskMeAnything question charges are just billed to your cell phone at 49 cents per question. You've got questions - librarians have answers. And they will provide them 24/7 at www.massanswers.org. Log on for real-time Q&A sessions with librarians when your local library is closed or when Googling gets you nowhere. 2. Use the minus sign when you don't want a topic included in the search results. (For example, type Paris tourism -art to find non-art museum attractions.) Note: When using the minus sign, be sure to include a space before it. 4. If you want information from a specific time frame, you can use two periods to specify a range of dates (for example, labor statistics 2000..2004). You can also use the Internet Archive to find information that was once online but no longer is. 5. The label "Sponsored links" means advertisers have paid for those results to be displayed. 6. Use RSS to track specific topics through free services like Newsgator. 7. If you're uncertain about a word's spelling, use a tilde in your search term (for example, for microdermabrasion sites, simply type microderm~). Dave of Rollyo was kind enough to e-mail me today and encourage me to make my Searchable Shakespeare entry a Rollyo Searchroll. I had been reading about Rollyo everywhere and it sounded interesting, but I just hadn't had time to stop by yet. I'm glad Dave prompted me to do so. It is pretty cool. Where else can you find a fashion searchroll created by Diane Von Furstenberg? Or Steve Rubel's searchroll on interactive marketing? I contributed Seeking Shakespeare and Writers on the Web today. Go and create your own. (But watch out...it's a bit like blogging. You may find yourself creating searchroll till the wee hours of the morning if you're not careful. Google launched a beta blog search engine. The advanced search page lets you search by blog, author, date, language, or keyword. Technorati, Feedster and other blog search eninges will now have run for their money. Business2blog also recommends Technorati's new Blog Finder, which lets you rank blogs by category.